April 13th, 2019 - Tokyo, Japan - Tokyo-based mobile game studio HyperDevbox proudly announces the release of "Stake Them All" for the Ethereum and TRON blockchain. 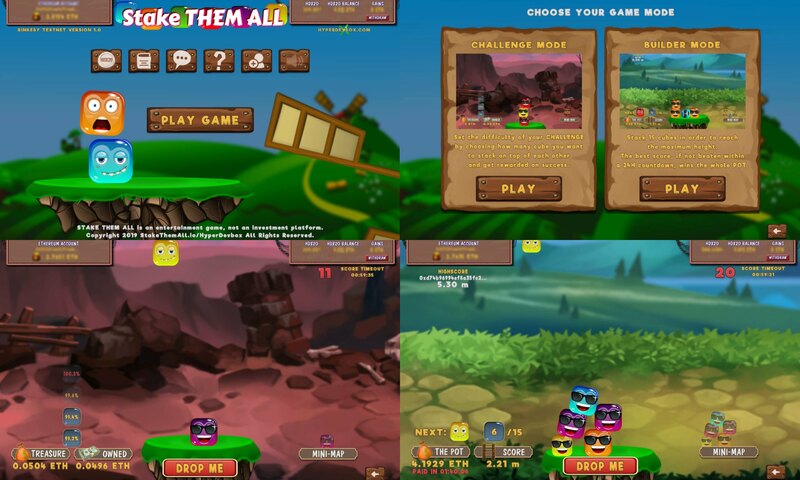 "Stake Them All" is one of the first polished 2D physics game developed exclusively for the blockchain and is featuring 2 different exciting games modes. In the "Challenge Mode", players set the difficulty of their CHALLENGE by choosing how many cubes they want to stack on top of each other and gets rewarded by crypto-currencies on success. In the "Builder Mode", Players stack 15 cubes in order to reach the maximum height, the best score, if not beaten within a 24H countdown, wins the whole POT. "We are so proud and excited to release another title for the HDX20 ecosystem and expand our current portfolio as we believe blockchain gaming is one of the major revolutions in the gaming industry. With the release of Stake-Them-All, we are demonstrating once more that blockchain gaming does not have to be limited to gambling games but can also offer polished skill-based games" says HyperDevbox founder and CEO Carlo Perconti. Play and earn crypto-currencies based on your game skills.